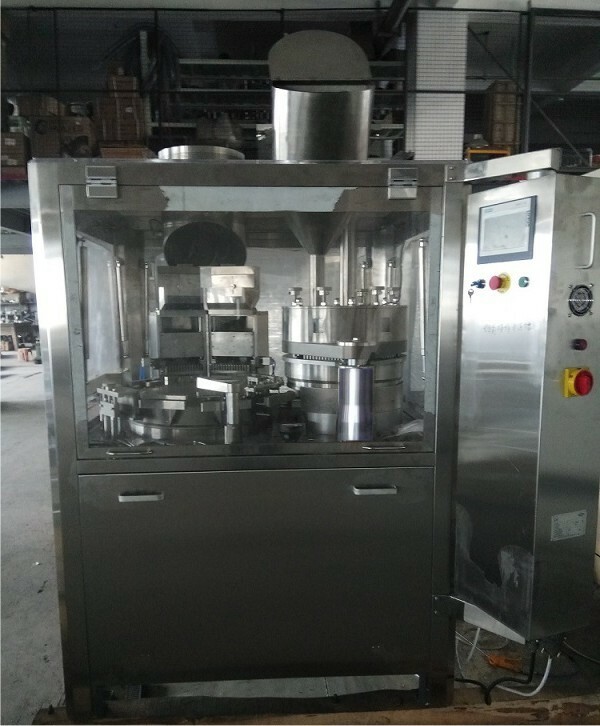 New Automatic High Speed Capsule Filler, Model 3500. Maximum output: 3,500 capsules per minute, 210,000 per hour. Comes with 1. Set of Change Parts (customer to specify). Can fill capsules “00”, “0”, “1”, “2”, “3”, “4” and “5”. Features: all stainless steel construction (and exceeds GMP Standards) 16 hole x 10 capsule filling segments, electronic capsule and powder level detecting systems, dust collector, faulty capsule reject station, a Upgraded Siemens Digital PLC Touch Screen Controller, Upgraded Siemens transducer, Upgraded Siemens relays, sensors, and breaker, integrated safety doors with automatic shut off if opened and emergency stop buttons, and dry vacuum pump. Electrics: 3Ph/60Hz/220Volts, 9.55Kw. Overall dimensions: 46” by 62” by 80” high. Delivery Time: Approx 8 weeks from receipt of 65% deposit.